A day-long multidimensional interactive event was hosted by CRI to celebrate the 99th birth anniversary of Father of the Nation’s Bangabandhu Sheikh Mujibur Rahman and National Children’s Day at Bangabandhu Memorial Museum, Dhaka. The event was clustered in different individual and parallel segments. 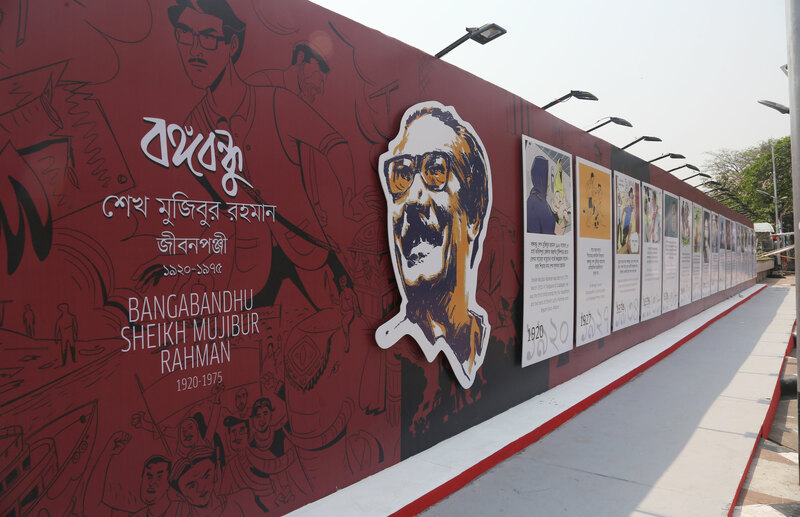 The hall room and venue premises were decorated with Mujib graphic novel based visual installations, photo exhibitions and interactive audio visual content on Bangabandhu. The celebration began with the visit of Honorable Prime Minister Sheikh Hasina at Bangabandhu Memorial Museum. Prime Minister visited the installations, exhibitions and the different designated corners to hold different segments of the daylong event. Honorable Prime Minister appreciated the whole initiative of CRI. One of the exciting segments of the celebration was Comic Contest. More than 50 children and teen-aged students participated in the Comic Contest. The participants of the contest have drawn and colored different visuals of graphic novel ‘Mujib’. A special screening of the ‘Hasina: A Daughter’s Tale’ took place at the event. ‘Hasina: A Daughter’s Tale’ is a docu-drama, based on Prime Minister Sheikh Hasina – the daughter of Bangabandhu Sheikh Mujibur Rahman, tells an enthralling story of a daughter emerging out of a tragic backdrop. The special addition of the event was – Chashma, a puppet show based on the selected areas of graphic novel ‘Mujib’. The puppet show was one of its kinds in terms of the crowd, people’s enthusiasm to attend the show. Six shows were staged in an open space with around 80 -150 audience attending each show. Timeline is installation exhibition of the different stages of Bangabandhu’s life. The timeline includes childhood of Bangabandhu, his sporty early life, memory with his father, his political leadership journey, the historic speech at Race Course ground, the tragic 15th August, 1975. A Japanese documentary titled ‘Rahman: The Father of Bengal’ was screened at the event. This is a documentary about Bangabandhu Sheikh Mujibur Rahman, shot in 1973, just a few months after the liberation war. The Filmmaker Nagisa Oshima captures the new born country as a visitor. There was a caricature corner at the venue where the visitor got free caricatures of themselves done by a group of cartoonist. Enthusiastic children and visitors crowded at the corner to get their caricature done. There was an augmented reality corner at the celebration event decorated with Tablets by ICT Division. A computer graphics on graphic novel ‘Mujib’ were demonstrated at the corner. Enthusiastic visitors explored different digital contents on Bangabandhu using those tablets. The prizes were separated into two categories, one for young children and one for youths and young adults in the professional category. Top three winners of Comic Contest from the professional category received Wacom Tablets while all winners were provided crest, certificate. ICT State Minister Zunaid Ahmed Palak MP, actor Jaya Ahsan, CEO of the Bangabandhu Memorial Museum, Mashura Hossain, CRI Executive Director Sabbir Bin Shams, CRI Creative Director Shibu Shill and Mujib Graphic Novel artist Syed Rashad Imam Tanmoy were present at the prize giving program and handed over the prize to the winners. On Bangabandhu’s 99th centenary celebration event, the 6th episode of graphic novel ‘Mujib-6’ has hit the shelves. ICT State Minister Zunaid Ahmed Palak MP, actor Jaya Ahsan, CEO of the Bangabandhu Memorial Museum, Mashura Hossain, CRI Executive Director Sabbir Bin Shams, CRI Creative Director Shibu Shill and Mujib Graphic Novel artist Syed Rashad Imam Tanmoy unveiled the 6th issue of graphic novel ‘Mujib’. In this issue, the hiccups of Pakistan movement, political suspense and mounting tensions, different aspects of Khawaja Nazimuddin, Sher-e-Bangla A. K. Fazlul Huq, Huseyn Shaheed Suhrawardy were covered.